1.1 CENTURY II BASIC OPERATION. 1.2 CENTURY III BASIC OPERATION. 1.3 RADIO COUPLER. . .•••. 1.4 GLIDE SLOPE COUPLER. .
1.5 STABILIZER AND OMNI TRACKER. Quick Checks.. . . .
General. . . . . . .
1C385 CENTURY II AND liB CONSOLE/AMPLIFIER. (a) Century II Theory • . . . . .
(b) Century liB Theory. 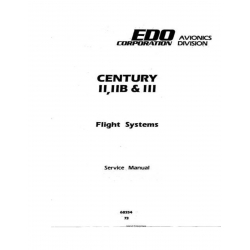 . . . . . . . . . .
4.3 10395, 1C515 AND 1C515-1 & -2 AMPLIFIERS ..
CENTURY II AND liB AUTOPILOTS. 6.1.1 Ground Checks. . . . . . .
6.1.2 Flight Checks. ..... .
CENTURY III AUTOPI LOTS .. Ground Checks. . . . . . . . . • . . . . . . . Ground Checks and Adjustment - Automatic Pitch Trim. 6.3.1 General. . . . ~ . . . . . . . . . . . . . . .
6.3.2 Ground Checks. . . . . . . . . . . . . . . . .
6.4 FLIGHT ADJUSTMENTS FOR 1C515-( ) AMPLIFIERS ..
6.4.1 Roll Threshold (Rth) Adjustment. . . • . . .
6.5 FLIGHT ADJUSTMENTS - ALL CENTURY III. 6.5.1 Roll - No Radio Coupler. .
6.5.2 Roll· With F\adio Coupler. . .'. . . . . . .
6.5.3 Pitch. . . . . . . . . . . . . . . . . .
CENTURY II AND liB CONSOLE/AMPLIFIER. CENTURY II SYSTEM CONFIGURATIONS ....... .
BLOCK DIAGRAM - CENTURY II CONSOLE/AMPLIFIER..
CENTURY III SYSTEM CONFIGURATIONS. • . • • . BLOCK DIAGRAM -CENTURY 11110395 AMPLIFIER. BLOCK DIAGRAM - GLIDE SLOPE-COUPLER 1C493. BLOCK DIAGRAM - STABILIZER/TRACKER.. . .
BLOCK DIAGRAM - AUTOMATIC TRIM SYSTEM. TRIM SENSOR IN "DOWN ELEVATOR" CONDITION .•. 660141 TEST SET.. . . . ... . . . . • . • . • • . 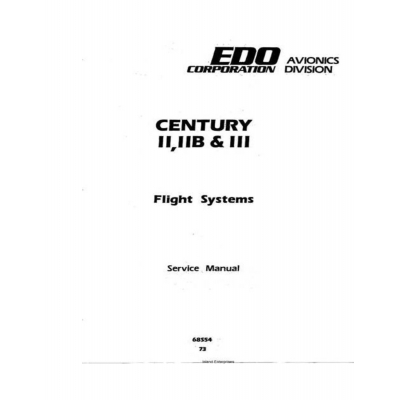 • . . . .
QUICK CHECKS CENTURY II TROUBLESHOOTING LOGIC CHART ..
CENTURY Ii INTERCONNECT WIRING DIAGRAM ...••. .QUICK CHECKS CENTURY III TROUBLESHOOTING LOGIC CHART. CENTURY III INTERCONNECT WIRING DIAGRAM. CENTURY III SCHEMATIC. . • . • . . .
CENTURY II PRINTED CI RCUIT BOARD. .
CENTURY liB SCHEMATIC. ..... .
CENTURY liB PRINTED CIRCUIT BOARD ..
CENTURY II & liB CONSOLE ADJUSTMENTS. CENTURY III CONSOLE SCHEMATIC ..... .
10395 AMPLIFIER SCHEMATIC. ..... .
10395 AMPLIFIER PRINTED CIRCUIT BOARD ..
1C515 AMPLIFIER PRINTED CIRCUIT BOARD ..
1C515 -1 & -2 AMPLIFIER SCHEMATIC. .
1C515-1 & -2 AMPLIFIER PRINTED CIRCUIT BOARD. CENTURY III AMPLIFIER TEST SET-UP. . . . . . .
SELECTOR RESISTOR CHART. . . . . . . . . . ROLL SIGNAL FILTER 1B440 SCHEMATIC ..•.. ROLL SIGNAL FILTER PRINTED CIRCUIT BOARD •. PITCH SIGNAL FILTER SCHEMATIC. . .... . PITCH SIGNAL FILTER PRINTED CIRCUIT BOARD .... .
1C388 RADIO COUPLER SCHEMATIC - SIN 6.000 & ABOVE. 1C388 RADIO COUPLER SCHEMATIC - SIN 1,480 to 6,000 ..
1C388 RADIO COUPLER SCHEMATIC - SIN UP TO 1.480.. . . . . . . .
1C388 RADIO COUPLER PRINTED CIRCUIT BOARD SIN 6,000 & ABOVE ..
1C388 RADIO COUPLER PRINTED CIRCUIT BOARD SIN 1,480 TO 6,000. 1C388 RADIO COUPLER PRINTED CIRCUIT BOARD SIN UP TO 1,480 •. 1C388C RADIO COUPLER SCHEMATIC SIN 1,480 TO 6,000 ..